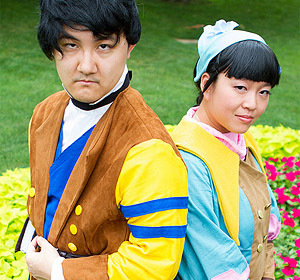 I finally got around to adding more photos of my Knives Chau costume, which you can see on the costume page for it. Both Jessie and I have worn it, so there are photos of both of us. 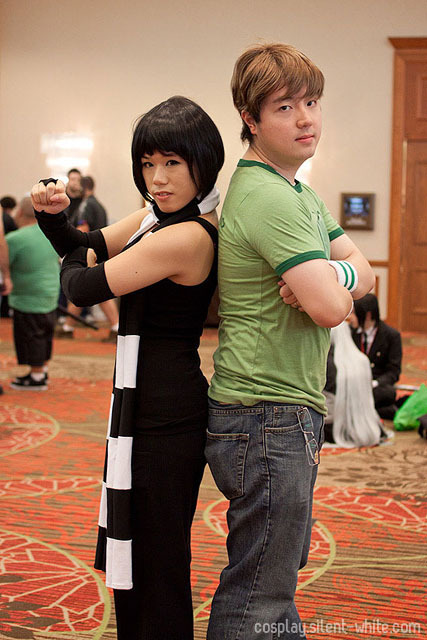 Here is Jessie dressed as Knives and Jack dressed as Scott Pilgrim during AnimeFest! Scott Pilgrim’s outfit: Is all store bought actually. His wig is New Look’s Roni, and I found the shirt and wristbands on Amazon. Just search for “Scott Pilgrim shirt”, and you can find all of the shirts he wore in the movie! 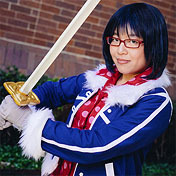 Knive’s wig: I don’t think it’s available anymore, but it used to be called the Hime on Cosplay Shopping. It was then renamed to Poppy, and now I don’t see it in their store at all. The only alteration I did was to cut the bangs shorter. Knive’s scarf: I originally made it with fleece, but it was way too hot to wear. 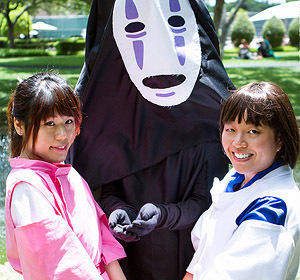 When AnimeFest came around, I re-made it with cotton (I think cotton interlock). I cut out 22 9x5in rectangles – 11 black, 11 white. I just sewed them together to form one really long scarf, then sewed the sides together so it was like a tube of fabric. In the photo above, you can see there’s a line down the scarf where I sewed the edges together. Knive’s armbands: Are made with a stretch cotton. I measured it so that it was a bit smaller than my arm, and let it stretch to fit. It actually stays up without any additional elastic. Near the hands, I cut out a triangular shape so that it only covers the top of the hands. There’s a ring made of fabric, so that the middle finger goes through it. Knive’s shirt and pants: Are store bought. Old Navy is kind of my go-to place for solid colored clothing. I bought both the black tank top and black pants from there. And that’s it! Knives is definitely my easiest costume yet!